The Japanese attack on Pearl Harbor on December 7, 1941 lasted 110 minutes, from 7:55 am until 9:45 am. Japanese naval forces included 4 heavy aircraft carriers, 2 heavy cruisers, 35 submarines, 2 light cruisers, 9 oilers, 2 battleships and 11 destroyers. The attacking forces came in two waves, the first consisting of 183 aircraft which included 40 torpedo planes, 49 level bombers, 51 dive bombers and 43 fighters. The second wave included 170 planes, 54 of them level bombers, 80 dive-bombers and 36 fighters. Over 350 Japanese planes were involved in overall attack. For part of the attack, and aftermath, first, let’s look back. In 1899, Gorokichi Nakasugi, a Japanese shipbuilder, brought a traditional 34-foot Japanese sailing sampan to Hawai‘i; this led to a unique class of vessels and distinctive maritime culture associated with the rise of the commercial fishing industry in Hawai‘i. Japanese-trained shipwrights adapted the original sampan design to the rough waters of the Hawaiian Islands. 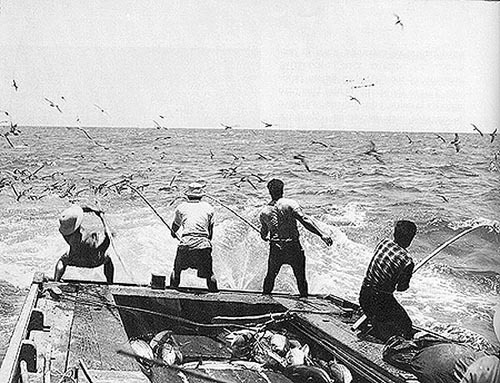 The fishermen used traditional live bait, pole-and-line method of fishing and unloaded their catches of aku (bonito, skipjack) and ahi (yellow-fin tuna) at Kewalo Basin. Local Japanese fishermen opened the commercial tuna industry in Hawaiʻi in conjunction with the innovation of modern packing plants. It was the ability to can tuna for the distant market which really made possible the expansion and modernization of the fishing fleet. The industry benefited American canneries. The sampan aku fleet was based at Kewalo Basin by 1930, and the McFarlane Tuna Company (later known as Hawaiian Tuna Packers) built a shipyard there in 1929 and a new tuna cannery at the basin in 1933. By 1940, there were over 450-sampans in the Territory of Hawaiʻi, making the commercial fishery the Islands’ third largest industry behind sugar and pineapple. That brings us to December 1941, more specifically, December 4 – four sampans (Kiho Maru, Myojin Maru, Shin-ei Maru and the Sumiyoshi Maru) set out for fishing off Oʻahu’s leeward coast. Later, on the morning of December 7, the Ward (US Destroyer No. 139,) conducting routine antisubmarine patrols in the Hawaiian area, had the distinction of firing the first American gun in anger during the Pacific war. She searched for a suspected submarine and subsequently fired shots at its conning tower. A fisherman suddenly started waving a white flag perhaps he had seen the determined depth-charge attacks and thought that the Americans would bomb anything that moved. Ward slowed and closed to investigate and took the small craft in tow to turn her over to the Coast Guard for disposition. The Ward had returned and witnessed the December 7, 1941 attack on Pearl Harbor. 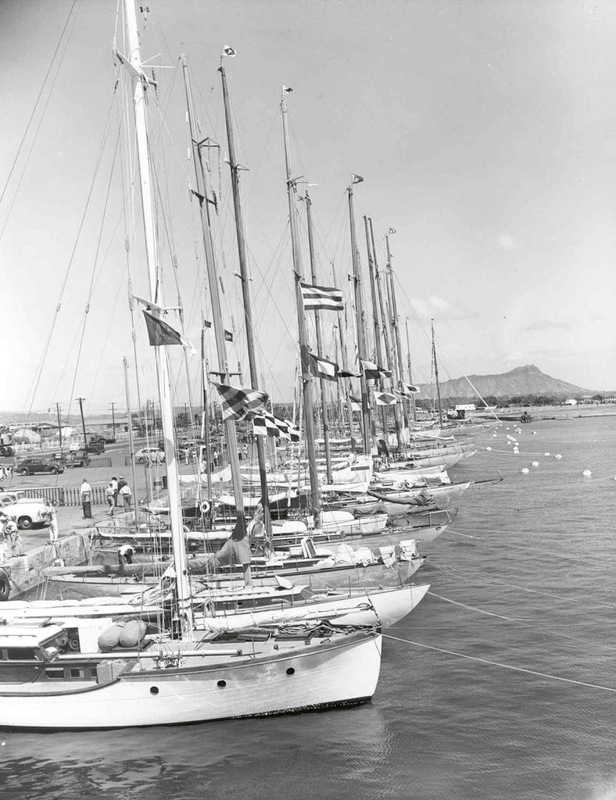 The image shows sampans in Kewalo Basin in the 1930s. In addition, I have added other images in a folder of like name in the Photos section on my Facebook and Google+ pages. The Island of Oʻahu has three of the State’s nine commercial harbors – Kalaeloa Barbers Point, Kewalo Basin and Honolulu Harbor. Kalaeloa Barbers Point Harbor, on the leeward, westerly side of the island, is in the vicinity of the growing city of Kapolei, while Kewalo Basin and Honolulu Harbor are located on the leeward, south shore, in the only well-sheltered area available for commercial purposes. Kewalo Basin harbor was formerly a shallow reef that enclosed a deep section of water that had been used as a canoe landing since pre-Contact times and probably was used since the early historic period as an anchorage. In 1899, Gorokichi Nakasugi, a Japanese shipbuilder, brought a traditional Japanese sailing vessel (called a sampan) to Hawai‘i, and this led to a unique class of vessels and distinctive maritime culture associated with the rise of the commercial fishing industry in Hawai‘i. The late nineteenth and early twentieth centuries were a time of intense development of the coasts of Honolulu, Kaka‘ako, and Waikīkī. In 1919, the Hawai‘i Government appropriated funds to improve the small harbor of Kewalo for the aim of “harbor extension, in that it will be made to serve the fishing and other small craft, to the relief of Honolulu harbor proper”. A number of land reclamation projects dredged offshore areas to deepen and create boat harbors, and used the dredged material to fill in the former swampy land. Kaka‘ako became a prime spot for large industrial complexes, such as iron works, lumber yards and draying companies. Since the area chosen for the harbor was adjacent to several lumber yards, such as the Lewers and Cooke yards, the basin was initially made to provide docking for lumber schooners. Dredging of the Kewalo Channel began in 1924 (the harbor is approximately 55-acres including ocean acreage;) ; but by the time the wharf was completed in 1926, the lumber import business had faded, so the harbor was used mainly by commercial fishermen. Half of the bulkhead along the mauka side of Kewalo Basin was built in 1928. The remainder of Kewalo Basin’s mauka bulkhead was constructed in 1934. Later, when it became a very popular swimming beach, the parallel coastal channel was closed to boat traffic. 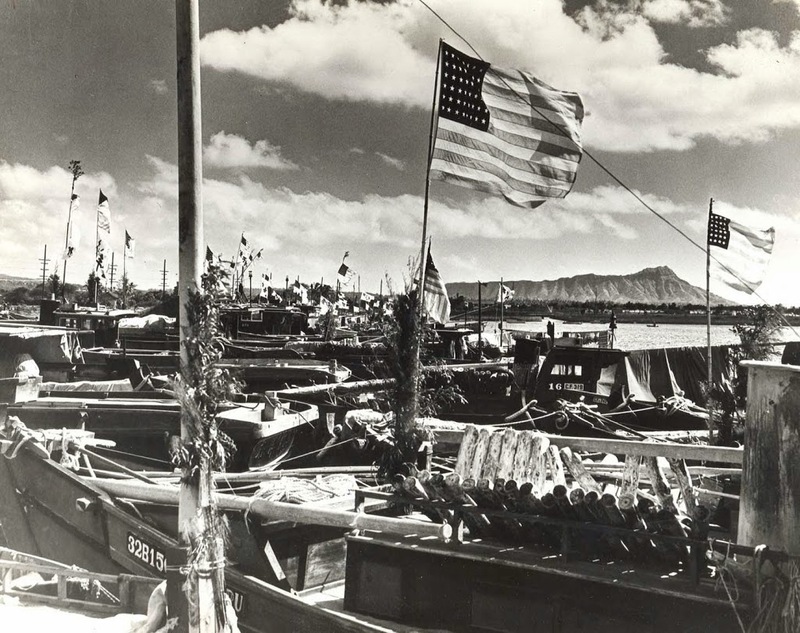 The sampan aku fleet relocated to Kewalo Basin by 1930, and the McFarlane Tuna Company (later known as Hawaiian Tuna Packers) built a shipyard there in 1929 and a new tuna cannery at the basin in 1933. Kewalo Basin’s Waikiki bulkhead was constructed in 1951. In 1955, workers placed the dredged material along the makai (seaward) side to form an eight-acre land section protected by a revetment—now the Kewalo Basin Park. The image shows an earlier time of Kewalo Basin.